The holidays are quickly approaching, but all you can think about is the extra weight that usually comes with them. Lucky for you, this year you don’t have to lose sleep over those pesky pounds. I have come up with a list of tricks to avoid mindless eating to help you stay on track this holiday season. I’m sure many of you have heard the term “mindful eating,” but what exactly does it mean? 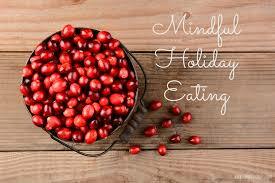 Mindful eating is a way of eating while focusing all your attention on the food in front of you. When people eat in front of the TV, they tend to completely lose track of how many times their hand goes from the chip bag to their mouth. This is called mindless eating. Unfortunately this is what typically happens at holiday parties. You see a friend you haven’t seen in a few months, you wander over to the appetizer table together, and while you’re catching up, you don’t even realize you’ve just eaten half a bowl of chips! Sound familiar? Well, this year’s holiday parties don’t have to be that way! Here are a few tips and tricks to help practice mindful eating so you can enjoy both the parties and the treats without the guilt. Pay attention to what you are eating. Do not eat while talking, watching TV, multitasking, etc. It’s important to focus on each bite. Focusing on each food item helps you to pay attention to how much you are eating so you don’t over do it! Listen to your body. When you start to feel full, stop. It’s important to listen to those internal ques. Also listen to your body when it is telling you that you are hungry. The longer you put off eating, the more you will want to eat when you finally have food around. Eat slowly and actually chew the food. Find a new flavor in each bite. How did that item make you feel? Think about where your food comes from. Who produced it, how far did it travel, etc.